Sawo Apartment 2 at Murni’s Houses, Ubud, Bali is on the first floor of a new two-storey building. Murni’s Houses are in a very quiet part of Ubud. 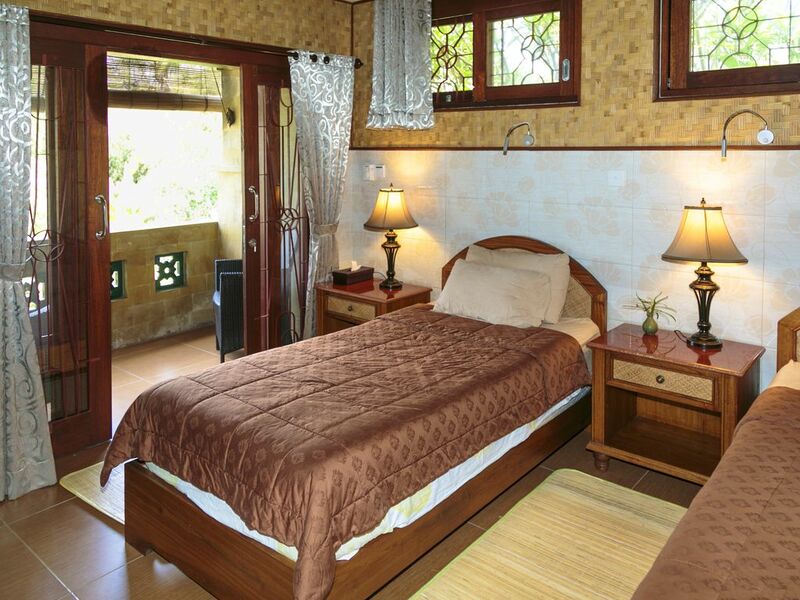 Sawo Apartment 2 is one of 7 guest houses and spa, which are built in a traditional Balinese compound and you will enjoy peaceful seclusion that’s just a three-minute walk to Ubud’s main street. 1 bedroom with a bed with 2 mattresses which can be pushed apart on request. Both bedrooms have en suite bathrooms – shower, basin and WC. Option of air conditioning in the bedrooms or open windows. A living room with a Chinese Wedding Bed, a sink and a WC. Both bedrooms have verandas with a view of the back garden. Private entrance, porch and rear door to the garden. Free 20 minute welcome massage at our famous spa, Tamarind Spa at Murni’s Houses, for all guests over 12 years old. Free coffee and tea facilities in the room. In the early 1980s I started to construct Murni’s Houses in Ubud, a complex of seven extraordinary residences and open-air pavilions amid a garden full of flowers, statues, fountains, trees and shrubs lying all by itself next to open fields. It is a wonderful introduction for first timers to Bali and a dependable refuge for her many guests who return each year. Just 5 minutes walk from the main road and accessed through a traditional Balinese roofed gate, it’s a place of tranquility. My latest venture is the creation of Tamarind Spa at Murni’s Houses.